Product #17452 | SKU BTR-BP827-JWP-022 | 0.0 (no ratings yet) Thanks for your rating! 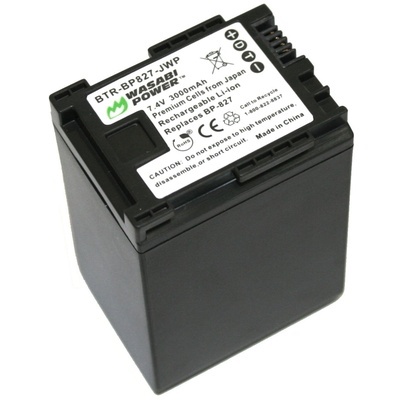 The Wasabi Power BP-827 battery replaces the Canon BP-827 battery pack. The BP-827 is a larger, high-capacity battery that provides a longer run time than the Canon BP-808, BP-809 and BP-819 external battery packs. The Wasabi Power BP-827 features 3000mAh which provides a longer run-time between charges. It is made with premium Japanese cells to provide maximum battery life and also comes with a 3-year manufacturer warranty. Additionally, the Wasabi Power BP-827 comes fully decoded, so it will display the remaining battery life and usage time and is completely compatible with all Canon original equipment including the Canon charger.